Tom Skerritt is madder than hell and he's not going to take it anymore! That's the premise of Fighting Back, a schizophrenic social-revenge movie that tries to go for that gritty realism all the while circumventing that realism with a plot that is pure bunk. How bad is Skerritt's New York City neighborhood? Well, within the film's first five minutes he's in a violent altercation with a pimp whereupon his car is run off the road and his wife, Patti LuPone, loses their unborn child, and then his mother walks into a drug store, is caught up in the middle of a robbery and then has one of her fingers cut off so the thugs can take her diamond ring. So Skerritt gets with a group of other disgruntled citizens to form their own vigilante group called Peoples Neighborhood Patrol (I know, there's no apostrophe, I just calls it as I sees it). At first they go about stopping purse-snatchers and drug pushers but soon it gets elevated to busting up pool halls and doing what amounts to preemptive strikes against sketchy types. But there's a fatal flaw in Fighting Back's story and that is the complete disregard that the PNP has for such things as Constitutional rights or the law. According to what's shown here, not only can citizens band together to take the law into their own hands but the powers that be, such as the police or the government, won't bother to intervene. There's a half-hearted attempt to give a perspective of the law by having a police officer, played by Michael Sarrazin, to be some sort of consultant to try and reign Skerritt's powermania in; but, naturally, he is gunned down during a PNP mugging. One would think there would be some legal issues with what PNP is doing, but they're barely touched on, and despite some skeevy racism involved, that too is tapdanced around in order to make Skerritt appear blameless. Not only does Skerritt not get into any trouble he is turned into some sort of folk hero and the movie ends with his successful run at being an elected official. 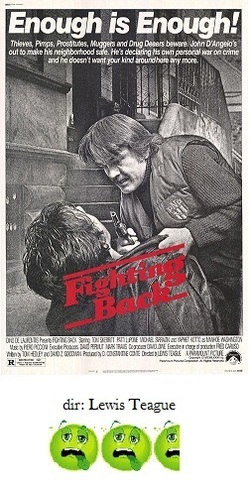 Some might say that Fighting Back shouldn't be taken so seriously, that it should be viewed as a sort of homage to Death Wish, but even the original Death Wish at least addressed the moral tightrope it walked upon. Fighting Back just blankly states that vigilantism should be rewarded at any cost. Despite all the realistic grime on display, Fighting Back is no more realistic than Harry Potter.